If you have an interest in one of our puppies…we would love to talk with you and answer any questions you may have . Puppies are chosen in the order of our waiting list as long as your position is secured with a deposit at two weeks old. The process will start with a phone call to one of us, and we will ask that you fill out the contact form. You are in no way obligated to buy a puppy from us because you submit this to us. The contact form makes it easier for us to keep an accurate record of people waiting on a puppy. If you are interested in a puppy from a particular upcoming litter, the contact form will make it easier for me to stay in touch with you . Once submitted, and only after we have spoken on the phone …you will be put on our notification list. We will notify you once the puppies are born …letting you know the colors and genders of the litter. I encourage you to have stayed in touch with me as well during the process of waiting because we often have many people waiting and hoping to get a puppy ,and us not requiring deposits to be on our list is not only beneficial to you ,but it allows us the privilege of being selective as to which homes our puppies go to. However , the position of first pick male and female can be secured in advance of a litter being born if we are confident that there is in fact a pregnancy and are loving the forever family that you will provide our puppies!!. Our list is a tool that we use to keep up with those who are waiting but ultimately we need to feel good about where they are going and by you staying in touch with us and showing us that you are excited and invested emotionally in this process ,as well as us getting to know a little about you and the kind of home you will provide……those are the families that we want our basset hound puppies to go to .These are also the families that we allow to secure first pick genders. It doesn’t matter if it is a large home or a small home….what matters is that the puppy will be well cared for, loved and have a great life. We absolutely love our puppies and At the end of the day…the health and happiness of our puppy trumps a list!! We reserve the right to not sell our puppies to just anyone that has the money!! At anytime during this process..you can change your mind and I encourage you to do so if you aren’t 100% sure you can provide a basset hound puppy a FOREVER home.. You are in no way obligated. 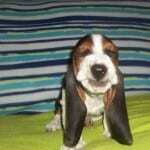 Once we notify you that the basset hound puppies are born we will start taking deposits shortly therafter!. It will be a $200.00 deposit for our American litters and a $200.00 deposit for our European litters. This deposit is nonrefundable and will come off the final puppy purchase price. If you have placed a first pick deposit on a breeding that does not result in a pregnancy we can move your deposit to another litter or will reimburse you. Other positions will not be secured until the puppies are born and we are comfortable with the litter being strong and healthy and the family is comfortable with the genders and colors that are available…as well as the position that they have on our picking order. If you were already on our notification list your position will not change if we receive your deposit within the first two weeks . It is important that you are prepared and we are able to contact you at this time so that you don’t lose your position on the list. If we don’t receive your deposit within that time period ,the list will change and you will be removed. I will not call you to ask about your intentions. You simply will not receive the next puppy pictures & video and you will know you have been removed from the list. I do not push my puppies on anyone so if you are not prepared and do not communicate with me ..I will assume you have moved on ,and changed your mind. Which is fine. Again it is important that you are prepared. Please note that you will not secure a position on our list just by filling out the contact form. The contact form is for our records. What secures your puppy pick position is actually a phone call. Most breeders require a deposit to secure a position on the waiting list. We operate on more of an honor system and want people to not feel obligated to get a puppy because they have given us a nonrefundable deposit. We want you to have time to think and make sure a basset hound is the breed for you, the timing is right, the color and gender you want is available, etc. I realize in 2018 emailing is what people do but when it comes to our puppies we like to speak to people on the phone as well. They are our babies. Our ultimate goal is to have a relationship with the people that own our basset hounds. So if you are interested in being “owned by a basset”.. remember to give us a call!! If the puppy you are interested in is available now ,you are welcome to come pick out your puppy in person at around 3-4 weeks, or if you live a long distance away….I will send you lots of pictures on the same day of every week .If you come to our home, it is important that you not visit any other breeders or handle other dogs prior to our visit. We will ask that you sanitize your hands and do not hold the puppy up to your clothing. Awkward…Yes, but it is for the safety of an unvaccinated litter. If it is your turn to pick a puppy…you can pick right away or you can wait until they are 3 or 4 weeks old. I know how exciting it is waiting on your new addition and many people want to wait to see there personality, while there are others that know right away. If the person in front of you on the list wants to wait…..that means puppy picking will start at 4 weeks. Everyone should know which puppy belongs to them by 5 weeks old .That is actually a good age to pick. Basset hounds ears are kicking in at that point, and they are starting to look more like bassets and less like puppies!! 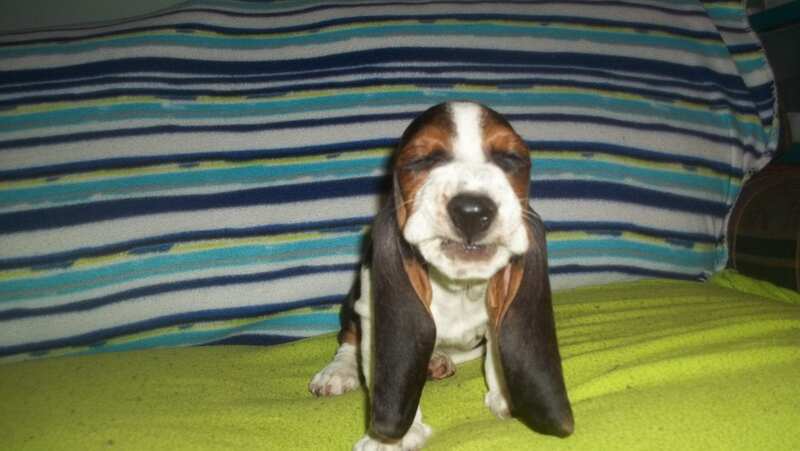 Bassets are born with short ears so after 4 weeks they really start to grow!! If we still have puppies unspoken for you are free to change your mind later if you choose to. Please note that in any litter ,we reserve the right to keep a puppy if we choose to ,which may alter your position on the list. We do not keep puppies frequently but if there is a particular litter that we would like to keep one from…we will make our decision by three weeks old so everyone on the list can choose. The balance after deposit is to be paid in cash when you pick up your puppy or by using PayPal on our website. Please note that if you use our website for final payment…you will need to add 3.3% of the balance you owe on your basset baby to cover PayPal fees. We prefer to not take checks for final payment, but they are fine for making your deposit.